Facebook is the biggest Social networking site of 2012 and with over 900 Million users, you will probably even find your maid on Facebook. Anyways, despite of various security and privacy settings which we can do to prevent our profile from any kind of abuse or spam. One particular feature which I’m going to talk today is how you can block people on Facebook. Specially, with people have their Ex’s and rivalry on Facebook, it’s a good idea to keep them in Facebook block list, to prevent any kind of misuse. For example, your Facebook timeline cover photo is visible to them (Public visibility by default) and they can easily search you via Facebook people search. By blocking such people on Facebook, you are adding another level or privacy settings to your profile. Specially, if your Ex bf or gf is stalking you badly or keeping an eye on your updates, it’s better to block them if you don’t want them to see your updates. This step by step guide, to Facebook block feature will help you to get started. 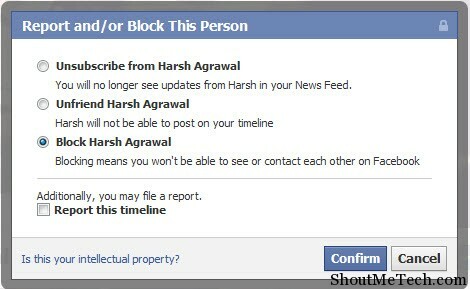 In new Facebook, it’s quite easy to block some one and unblock. Though, we will look into unblocking feature in separate post and for now lets learn How to block people on Facebook. 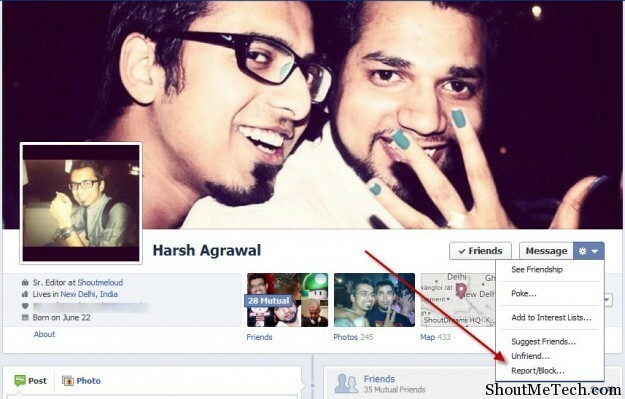 Login to your Facebook profile and open the person profile, whom you want to block. For this tutorial sake, I’m blocking my other profile. In that person profile (Whom you would like to block), click on Drop down next to message field and select the option which says, Report/Block. Now, a pop up will appear with three options which you can use to completely ignore that person. Unsubscribe from person: Select this option when you want that person to be in your friend list but don’t want to see their updates. Unfriend : Classic options to get rid of a person on Facebok. Block Person : Option which we are talking about here. Using this option person won’t be able to see your profile when logged in from his profile and won’t be able to get in touch with you. Best way to get rid of stalkers and irritating people on Facebook. As soon as you confirm the blocking options, you will be redirected to your FB homepage and you will not be able to see other person profile and vice-versa. In short, the blocked people Facebook profile doesn’t exist for you anymore and similarly other person won’t be able to find and see you on Facebook. I use this feature quite often to get rid of spammers, stalkers and irritating people. After all, Facebook is all about connecting to right people and with close friends. This is one problem, which I have been trying to find and answer and will update the post, as soon as I hear back from FB support. If you are facing similar or any other kind of error message, let us know on our Facebook page. Have you used FB friend blocking feature before? Have you faced any issues while blocking someone on Facebook? Blocking those “Like whore” pages who put out pictures like “Like this if you hate cancer” and “Like this if you’re breathing” doesn’t work. It says “Blocking System is overloaded.” It’s been saying that for hours and I heard this problem has been happening to similar pages and has been going on since Jan or Feb this year.